The TUC’s Richard Exell analyses today’s unemployment figures, explaining how they are directly connected to this coalition government’s current economic policy. It’s hard to be clever about this month’s labour market statistics (pdf) – just listing the items in this avalanche of misery is going to take time. • The last time the unemployment rate was higher was May-July 1996, the last time the level was higher was Aug-Oct 1994. Employment fell 178,000 to 29.1 million and the employment rate fell 0.3 points to 70.4 per cent. Women’s unemployment rose to 1.069 million, 7.3 per cent; this is the highest female unemployment rate since Apr-Jun 1994 and the highest level since the current series of records began in 1992. David Cameron claimed at PM’s Question that there are more women in work than “at the time of the election”. As Nicola Smith has pointed out, this is true, but only because there are nearly 200,000 more adult women in the population – the working age female employment rate has fallen slightly, from 65.5 to 65.4 per cent. There had been some speculation that youth unemployment might pass the million mark. In the event, this didn’t happen. • The highest youth unemployment rate since 1992 (21.3 per cent). The male youth unemployment rate (23.6 per cent) is also the highest since 1992. There are now 257,000 young people who have been unemployed for over a year, the highest figure since Dec-Feb 1994. 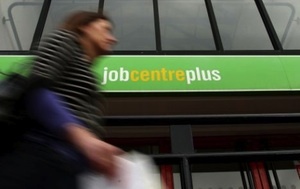 Overall, 867,000 people have been unemployed over a year and 423,000 for more than two years. Of course, the usual warnings about over-interpreting one month’s figures must apply here. If this becomes a trend, it could be worrying – it might be a sign of the end of the ‘labour hoarding’ that characterised the recession. Businesses held on to valued workers because they were concerned that they might be held back by staff shortages in the recovery; if corporate Britain has decided that the recovery has come to an end before it began they may revisit that decision. One further hint that this could be happening lies in the most recent productivity figures, which up till now have been very depressed: output per hour rose 1.3 per cent in the second quarter of 2011, the biggest rise since before the recession. This is a strange response. Today’s figures are for the period from June to August and the labour market is famously a “lagging indicator”, so it simply isn’t possible for these results to have been caused by the recent troubles in the eurozone. The current uncertainty will have an effect on jobs, especially in manufacturing and other exporting industries, but there hasn’t been time yet for it to show up. The simplest – and most likely – explanation for today’s figures is that we are seeing the impact of more than a year of stuttering demand. When will the government admit that austerity isn’t working? The government’s inability and unwillingness to confront the rising level of joblessness and the predicted rise in poverty is just shocking. It feels like 1979 all over again. @1 – They won’t. It’s doing the job THEY want it to do. Are “extra-ordinary measures” to loosen monetary policy the opportunity to loosen fiscal policy without causing inflation, pushing up interest rates AND to decrease government debt? Things look so frightening out there in the real economy. I am watching as friends become frightened, unemployed or see their disposable incomes drop. The thought of 10 years of this makes me angry and sad. Isn’t there a magic bullet? Most of us agree that when banks are more concerned about the liquidity ratios than the normal process of credit creation the public sector has to step in to stimulate demand. The barrier to salvation seems to be an irrational fear from those on the right of increasing government debt levels. At their peril right wingers have ignored Godwin’s sectorial balance law. A law which has held up for over 300 years and fits perfectly with the observable facts we see today that austerity doesn’t seem to work even under its own terms of reference – paying down government debt. With banks deleveraging and unwilling to perform their normal credit creation process, QE appears harmless enough in terms of widening the money supply and thereby potentially triggering inflation. It may also give us the opportunity to monetise the government debt with no concomitant inflation. From my perspective, unless somebody can point out where I’m wrong, the QE also seems to show Chancellor Osborne’s austerity program to be a malignant deception foisted on a country that was too gullible to question the economics. The Bank of England is now trying a third tranche of QE. The Gov’nor of the Bank has looked at the UK money supply over the last year and he too sees the banks deleveraging. He sees the UK money supply widening by less than 2% when he knows full well at least 5% is needed to stop the economy contracting. In a vain attempt to rebalance the multiples (due to the fiscal multiplier) of £120 billion taken out by Osborne’s cuts he has ordered the pushing of £75 billion to the banks and pension funds in return for which they surrender to the Bank a huge slice of the outstanding government gilts. Predictably, as with the previous rounds of QE the banks will use this to strengthen their liquidity ratios or spend this on bonuses and dividends and speculation in the futures markets. This speculation will lead to at least a short term period of inflated oil, food and commodity prices. Again, not one bean will end up in the real economy stimulating demand. The lesson of QE is that if the economy needs monetary stimulus this should be done with fiscal expansion – as we know loosening monetary policy by giving money to the banks will have no positive effects whatsoever. We’ve been there and tried that. We gave them £200 billion in 2009 and they just gambled it away. But aside from lowering the interest costs for future government borrowing is there some good that can be clutched at from the QE? Most of us agree that fiscal loosening rather than monetary loosening would be effective. It would get money into the real economy where it could act to increase demand. What we would want is the £75 billion created by the Bank of England using QE and this money should be used to reverse the VAT rises, tuition fee increases, benefit cuts, public sector cuts etc. This money would flow into the real economy and stimulate growth. QE in the UK works through the Bank of England creating £75 billion (or whatever it wants) electronically – it is a central bank and can credit its reserves with as much money as it likes. The Bank lends this £75 billion to a Special Purpose Vehicle – a wholly Government owned PLC called the Asset Purchase Facility. The APF then buys through auctions £75 billion of outstanding Government gilts from private banks, pension funds and other institutional investors. The banks and recipients make huge profits (because of the relationship between coupon and yields) from the sales and get cash credited on their central bank reserves. The APF takes on the government gilts. So far so good – money created or destroyed anywhere. What is intriguing is that this offers a chance to destroy government debt with no inflationary risk or build up of debts anywhere. How? The AFP after QE will be sitting on £75 billion of government debt. It is wholly owned by the government. It could just retires the debts by communicating that they no longer exists. Job done. There is no further inflation or loss of investor confidence. Already we have a situation where over a third (£200 billion) of the outstanding National debt is sitting in the Government owned Bank and another section of the Government, the Debt Management Office – an arm of HMT – is paying interest to the Bank which is again just sitting there unused. It would be more honest to monetize this debt and just retire it. This would be the honest thing to do. The outstanding gilts (accounting at the moment for a third of outstanding UK Government debt) will have to be monetised anyway, just on practical grounds. The only way not to monetise the debt remember is for the APF to sell the gilts it is sitting on back into the private sector and then cancel the cash it receives for selling them. This would nullify the £75 billion lent to it from the Bank of England initially to buy the gilts in the first place. With the Bank sitting on £200 billion (and some estimating this will rise to half government total debt or £500 billion) it just simply will not be possible to sell this at any time before the gilts mature and expire naturally. How on earth could the government fund its future normal gilt issues when the Bank was simultaneously dumping an additional £200 or potentially £500 billion worth of gilts from the APF. The APF certainly won’t be able to dump its stock of bought up gilts whilst the UK government is still runs a deficit (forecast to be at least 2016 and likely to be a lot, lot further into the future than that). Much of the gilts bought will have expired before then anyway. So if it can’t happen whilst the UK Government still will need to borrow can it happen in a hypothetical future when the deficit is paid off (if it ever is)? No, it certainly can’t happen when the economy has recovered. At the point when the economy has recovered the private banks will be creating enough lending to allow the money supply to widen at its normal rate. Dumping an additional £200-500 billion of liquidity out on the market at this point will cause rampant inflation. Once and if the money supply is widening again naturally, dumping out extra money will cause inflation. Until then we are left with a ridiculous situation where the Tories are moaning about the huge and “unaffordable” government credit card bills. At the same time over a third of the debt they are moaning about is stuck in the government owned Bank of England with no hope of it ever being anything other than cancelled and retired. To add to the hilarity the Treasury, through a wholly government owned agency called the Debt Management Office pays interest on the £200 billion in the APF to the wholly government owned APF. This money is just building up and will eventually (as all profits for the Bank are) be returned to the taxpayer. You couldn’t make this up. Please tell me what problems this solution would cause as I just can’t see it causing inflation, effecting investors views about the value of the currency or desirability of future government debt. it’s not as if you would advocate doing this type of QE to allow above trend government spending. Like the QE it is just something done in extremis of a liquidity trap. Shouldn’t the QE process, as it has already happened, be used to some advantage – clearing government debt by “magic” and allowing fiscal loosening to stimulate demand? Let me try and put this more simply. The government has two levers it can pull to drive growth. Fiscal or Monetary. The Tories are denying themselves use of any fiscal levers. They say the reason this is denied is due to the outstanding level of government debt. Leaving aside the truism that austerity measures by definition, through the effect on confidence and for monetary reasons are making things much, much worse- sucking demand out of the economy like water through a sieve. It isn’t even working under its own frame or reference- government spending is increasing rather than shrinking as despite cutting spending on useful public sector functions more money is flying out the door from lack of growth, lost tax revenue and higher spending on automatic stabilisers. That leaves monetary policy. interest rates are on the floor at 0.5% so can’t go any lower. That leaves QE. The Government owes shy of £900 billion. Sitting in the Asset Protection Facility- a wholly owned by the Government subsidiary of the Bank of England is over £200 billion of the outstanding government debt. The APF bought up this debt in 2009 using QE- money created from nothing using the Bank of England’s powers to credit reserve accounts at will. This £200 billion debt can be destroyed in a blink of an eye by the Bank just ripping the gilts up. Nothing more, nothing less. No effect on anything anywhere else except the Governments outstanding debt levels. Instead the other option is for the Bank to try and sell this debt back into the market at some point in the future before the gilts mature, expire and cease to have any effects. The crazy, crazy thing here will be that the gilts will be sold back to the private banks and pension funds who sold them to the Bank in the first place and the Bank will receive cash from those who buy them. It will simply then rip up the cash it has been given. This is absolute, absolute madness. Which path would you like to see the Government order the Bank to take? @sweetness – my main worry about all this monetary / fiscal analysis is that it may cause us to miss a bigger point: our prosperity currently rests on flawed foundations. Having a smart plan to get money flowing better and growth ignited is only meaningful if the foundations of real social prosperity are in place to make use of it. Otherwise, the efforts will be wasted on those who are best placed to feed on such financial initiatives – and there are plenty of them out there. We need to simultaneously look at the affordability of land and property to labour and business as well as how to increase production of food, skilled labour and the expensive end of manufactured goods. If we don’t do this then we can kiss mass prosperity good-bye and embrace neo-feudalism. ure basically saying print money and give it to the banks- That’s what u’ve said in long way. surely if AFP was seeling out the gilts the reverse would be happening, the goct would be taking liquidity out of the economy, WITHOUT having to raise rates…. I’m not making value judgement, just trying to work thru your logic, certainly more interesting than the rubbish on other sites lol.